During the month of March, We checked out Rainbow and You book for St. Patrick's day. It is beautiful book with colorful illustrations of the Rainbow. For the craft, CJ wanted to do a Double Rainbow painting. Everyone knows rainbows look magical, but how do they work? You'll find out when you join the Rainbow Patrol. Rainbow expert Roy G. Biv will guide you back in time to learn the importance of rainbows in ancient cultures. You'll go inside a raindrop to discover how light bends to create the rainbow's dazzling colors. Finally, you'll return home and learn how to make your own rainbow! You'll become a real rainbow expert as noted astronomer E.C. Krupp and artist Robin Rector Krupp combine fascinating facts with dazzling illustrations to reveal the secrets of the rainbow. The creators of The Big Dipper and You bring their celestial know-how a little closer to earth in this entertaining introduction to our most colorful natural wonder. Rainbows are CJ's favorite and she loves all rainbowy stuff. She loved this book. A leprechaun, described as Roy.G.Biv, appears in the book with yellow slicker, blue overalls, rainbow-colored boots. His appearance made her to giggle and She loved his rainbow boots(May be an idea for a shoe makeover:-)). We had a discussion on how a dim secondary rainbow is seen outside the primary bow - Secondary rainbows are caused by a double reflection of sunlight inside the raindrops, as a result of the second reflection, the colors of a secondary rainbow are inverted compared to the primary bow, with violet on the outside and red on the inside. The secondary rainbow is fainter than the primary because more light escapes from two reflections compared to one. After the discussion, CJ made the double rainbow painting. For the secondary bow, after painting the stripes of the bow, we took out the excess paint by using kitchen tissue paper. Removing the paint resulted in a fainter look of the secondary bow. After painting the double rainbow, Cj made hand prints in the Alexander's band(the space between the two rainbows). I saw this idea of making hand prints in rainbow colors at the colours dekor blog. What an amazing picture! It looks absolutely wonderful! A real piece of art. Brilliant! Thank you for sharing it on Kids Get Crafty! It is beautiful! 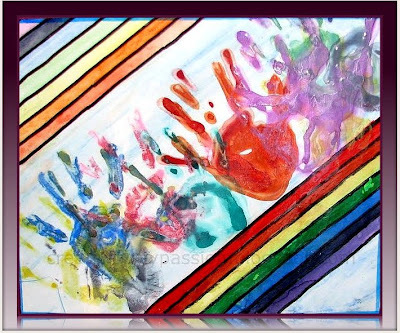 Rainbows and handprints are two of my favourite kinds of art. Love how bold and colorful it is!! Definitely love the vibrant colors! Great job and will check out the book too! This is so gorgeous. Rainbows and hand prints make for a fun and colourful activity.. The double rainbow turned out beautifully Esther. I love the way you spend time with your child and bring her favorite things to life with so much creativity and love! That is really beautiful - definitely a keeper! Thanks for linking up with Fun for Kids Friday. that's very cute and beautiful. very very beautiful. i liked all the art here on this blog. do visit my blog too. LOVELY!! Thank you so much for sharing.